Anomalous coronary arteries originating from the opposite sinus of Valsalva (ACAOS) are associated with adverse cardiac events. Discrimination between ACAOS and coronary artery disease (CAD)-related perfusion defects may be difficult. 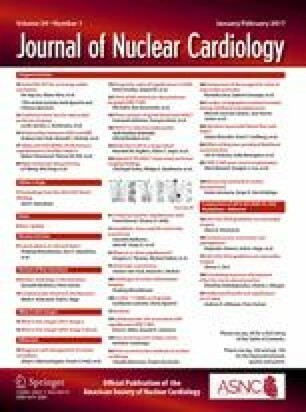 The aim of the present study was to investigate the value of hybrid coronary computed tomography angiography (CCTA)/SPECT-MPI in patients with ACAOS and possible concomitant CAD. We retrospectively identified 46 patients (mean age 56 ± 12 years) with ACAOS revealed by CCTA who underwent additional SPECT-MPI. ACAOS with an interarterial course were classified as malignant, whereas all other variants were considered benign. CCTA/SPECT-MPI hybrid imaging findings (ischemia or scar) were analyzed according to the territory subtended by an anomalous vessel or a stenotic coronary artery. Twenty-six (57%) patients presented with malignant ACAOS. Myocardial ischemia or scar was found only in patients who had concomitant obstructive CAD in the vessel matching the perfusion defect as evidenced by hybrid CCTA/SPECT imaging. Hybrid CCTA/SPECT-MPI represents a valuable non-invasive tool to discriminate the impact of ACAOS from concomitant CAD on myocardial ischemia. Our results suggest that in a middle-aged population myocardial ischemia due to ACAOS per se may be exceedingly rare and is more likely attributable to concomitant CAD. Christoph Gräni and Dominik C. Benz share first authorship. Ronny R. Buechel and Philipp A. Kaufmann share last authorship. See related editorial, doi: 10.1007/s12350-015-0384-0. We thank Verena Weichselbaumer, Edlira Loga, and Ennio Mueller for their excellent technical support. CG, DCB, CS, RRB, and PAK were responsible for the conception, design, analysis, and interpretation of the data and drafting of the manuscript. APP and OG were involved in the analysis and interpretation of the data and drafting of the manuscript. JV, FM, MP, OFC, JS, and TAF were involved in acquisition of data and drafting of the manuscript. All authors read and approved the final manuscript. All authors have the following to disclose: The University Hospital of Zurich holds a research contract with GE Healthcare.